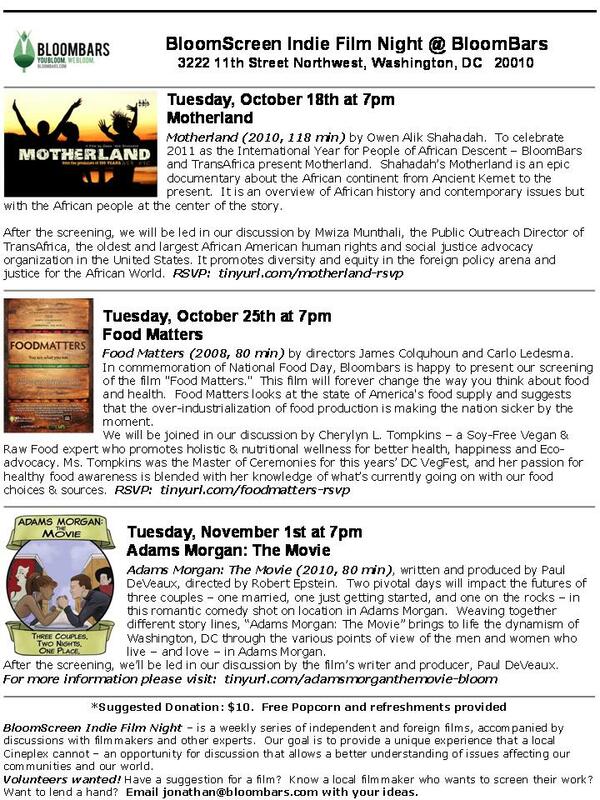 Back in October, 2011, I sent out an email that BloomBars asked me to be the featured speaker for the National Food Day screening of “Food Matters” they did on October 25, 2011. The week before, Gowri Koneswaran … Program Director of BloomBars, also honored me by asking me to be their “Seed of the Week” for their weekly eNewsletter and to highlight the upcoming speaking engagement for them. Featured here is the email they sent out to their group (and passed along to mine). Further down is the BloomScreens Film Night flyer promoting the screening of “Food Matters” and me as featured speaker. Separately, I’ll post my expanded featured article (“Life is About Growth: The Right Ingredients Help!“) from their website here on this blog (or click highlighted article). Also, BloomBars did a blog post promoting the upcoming event on their website, which can be found here. The ‘Food Matters’ trailer is at the end of this post too. I can definitely say the film screening and after discussion was fabulous!! I look forward to doing more to support the growth of this great community space!! Please check out more about BloomBars when you get a chance (and donate to their wonderful and worthy cause!!). Life is about growth. As we evolve, our lives too will grow from people, places and experiences that planted metaphorical “seeds” within us to expand our lives exponentially. It’s about blossoming from a deeply rooted purpose within all of us so that we too can plant and share with others. BloomBars’ mission, people, activities and very name inspired me to write about why we all must “Bloom,” therefore encouraging growth in others. As soy-free vegan and raw food expert, I know that having the right ingredients help us all grow and keep us living healthy lives as we evolve with age. This documentary analyzes the proliferation of chemical additives in “natural” foods, looks at the relationship between the lack of nutrients in the American diet and the nation’s rising health care costs, and offers tips for system detoxification. BloomBars plants seeds daily, and it shows. Love blossoms through Art, Community, Joy and Beauty – the necessary nourishment for growth! Thanks BloomBars … your “Garden” is quite lovely indeed! Did you know BloomBars is entirely run by volunteers? As a startup, we rely on the passion and commitment of our volunteers to operate our organization, ensuring the performances and classes you enjoy will continue every single week.BloomBars volunteers have created an invaluable network of artists, activists and professionals through their work with us! Online Marketing Volunteer – help us create the newsletter and website! As always, if you have the time and passion to volunteer with us but do not fit in the above roles,please email us at info@bloombars.com! Include your availability and what area of expertise you think would help grow BloomBars further. Those doors aren’t free! Help us defray the costs of our beautiful new front doors by donating toBloomBars online! By donating online, you will automatically receive a receipt so you can deduct your charitable donation on your taxes! Wandering Souls returns for 2 more all-new shows! After three stellar (and standing room only) performances last fall,BloomBars is happy to welcome back Wandering Souls for their all-new theatre production: Reflections: Plays from Saint Elizabeths Hospital. Since bringing their production of Twelfth Night to Saint Elizabeths Hospital last fall, Wandering Souls has developed a unique relationship with this historical DC institution. Over the course of the summer, Andy Wassenich (Wandering Souls company member) with the help and guidance of the Saint Elizabeth’s staff has been leading a playwriting intensive with a handful of individuals in care at the hospital. At the end of the 8-week course, each of the students wrote a ten-minute play on the themes of recovery, overcoming adversity, and hope. Learn More about the Play and Wandering Souls! Nila Kay speaks a musical language that blends acoustic pop with funky neo-soul to create her own avant-garde dialect. While her sounds may be hard to define and her compositions difficult to conveniently box into a single genre, her passion is straight up. Raised in a Black-Jewish household in Providence, Rhode Island, Aaron Samuels is an award-winning poet, educator, and community organizer. Aaron has competed on performance poetry teams for the last six years, consistently ranking among the top poets in the youth, collegiate, and national competitions. Food Matters by directors James Colquhoun and Carlo Ledesma – is a hard hitting, fast paced look at our current state of health. Despite the billions of dollars of funding and research into new so-called cures we continue to suffer from a raft of chronic ills and every day maladies. Thursday, 10/20: Samba Classes with Zezeh, every Thursday at 6:30 pm. Saturday, 10/22: Bachata class every Saturday at 3:30 – 4:30 pm. Sunday, 10/23: Capoeira class is cancelled this week but resumes as usual next week. Drum up a storm in Drumming Class at 1 pm. Monday, 10/24: Poetry in the Morning at 7:30 am. Belly Dance class starts at 6:45 pm. The Garden Open Mic featuring Nila Kay begins at 9 pm. Wednesday, 10/26: Wednesdays at BloomBars – meditation class at 7 pm. Blooming Soon: Be on the lookout for these upcoming events! Learn how to use all your senses to open doors to creativity! Attend Knowledge Common DC’s groundbreaking class with playright Caleen Jennings! Open eyes allow visual art to inspire character narratives using all five senses. Open voices bring those characters to life in performance. The Hirshhorn becomes a playground of the imagination for this interdisciplinary class. When: 12 to 5 PM on Saturday and Sunday, October 22 and 23. BloomBars was excited to host Ella’s first feature performance at “The Garden” open mic (every Monday atBloomBars recently. She wowed us again at Playing for Change Day. Next up: Ella’s headlining our Youth Open Mic on October 28th. Watch the Video! Are great writers book lovers as well? Perhaps. Award winning poet Mary Jo Bang has worked as a commercial photographer, a research assistant to a geneticist, a welfare caseworker, a sweatshop garmet worker, a writer, and a teacher, among other things. She connects the dots between her love of reading and transition as a writer. She explains, ” I don’t know when reading slid over into wanting to be a writer. There was the love of the story, the love of the poem, then, rather seamlessly, the wanting to write the story, write the poem. If that desire is strong enough, and persistent enough, you do whatever you have to do to teach yourself how to cross over from being a reader to being a reader who is a writer. For me, the crossing over took a very long time and there were many interruptions but the desire never lessened. But I first had to learn how to learn.” Are you fond of reading? Are you open to learning? Are you ready to open a door to new or old stories? If so, perhaps it is time to experiment in some creative writing! Learn more about Mary’s many creative incarnations here courtesy 99percent. BloomBars is working to inspire and unite communities through the arts. Our goal is to help foster personal and collective growth, and cultivate a legion of artists to be the catalyst for community transformation across the globe. BloomBars is a safe space for creative expression, honest conversation, personal health and wellness, and entertainment in a rich cultural environment. We redefine the perception of a bar, and provide a space for a multi-generational community to gather in an alcohol-free environment. BloomBars hosts a wide variety of arts classes for people of all ages and experience levels. Every day of the week, professional instructors lead community members in dance, theater, visual arts, music, poetry, and film. This email was sent to (email). To ensure that you continue receiving our emails, please add us to your address book or safe list. View this email on the web here. You can also forward to a friend. Subscribe.